Sony Pictures' highly-anticipated Venom spin-off started production back in mid-October, and now it seems principal photography may have come to an end. Over the weekend, star Tom Hardy sent out a series of Instagram photos, some of which are with a number of crew members including cinematographer Matthew Libatique and his camera team along with the "MVP sound team, with some posts featuring the word "Wrapped," including one shot where he says "Wrapped life back bye." Here's wht the actor had to say in a photo with him and the sound team. "Wrapped SAN Fran Jam DuN. Sound Team Venom MVP crew shout out to all the crew on Antidote legends all. Outstanding work team. Thank you all. Am humbled and absolute Honour and a privilege. You killed it. Smashed that Thank you for letting me run with you." While we don't have any official word that filming has wrapped on Venom, it wouldn't be surprising, since a three-month shoot for a movie of that stature is common. These seemingly final photos from the set come just days after there were rumors surfacing that Tom Holland will in fact have a cameo as Peter Parker, although he will not be seen as Spider-Man at all in the movie. There had previously been reports that Spider-Man won't be seen in this movie at all, and it seems that is actually true, but Peter Parker will reportedly be seen, after the actor was spotted on the set not too long ago. One of the biggest questions surrounding this movie is who the villain may be, with numerous reports claiming Carnage is the main villain. In fact, Tom Hardy posted a photo earlier this month that was later deleted, which certainly seemed to indicate Carnage is in fact the villain. There had been rumors that Riz Ahmed (Rogue One: A Star Wars Story) will be playing this character, since his role was never revealed when he joined the cast last year, but the actor was spotted on the set in December with a report claiming that he's playing Dr. Carlton Blake. In the comics, Blake heads up the Life Foundation, which is trying to replicate Venom's powers, resulting in five symbiotes, Agony, Lasher, Riot, Phage, and Scream, that they use to try and destroy Venom. The Venom cast also includes Michelle Williams as Anne Weying, Jenny Slate and Woody Harrelson as unspecified characters, and Reid Scott, who is reportedly playing Patrick Mulligan. Ruben Fleischer (Zombieland) is directing Venom from a script that has been worked on by Kelly Marcel (Fifty Shades of Grey), Jeff Pinkner (The Amazing Spider-Man) and Scott Rosenberg (Jumanji: Welcome to the Jungle). Sony has set an October 5, 2018 release date for Venom, putting it up against Warner Bros.' A Star Is Born remake and 20th Century Fox's Bad Times at the El Royale. 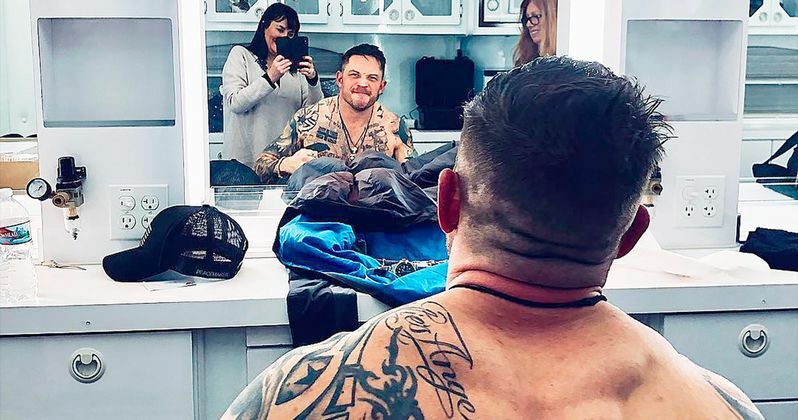 Take a look at what could be the final set photos from Venom, courtesy of Tom Hardy Instagram.